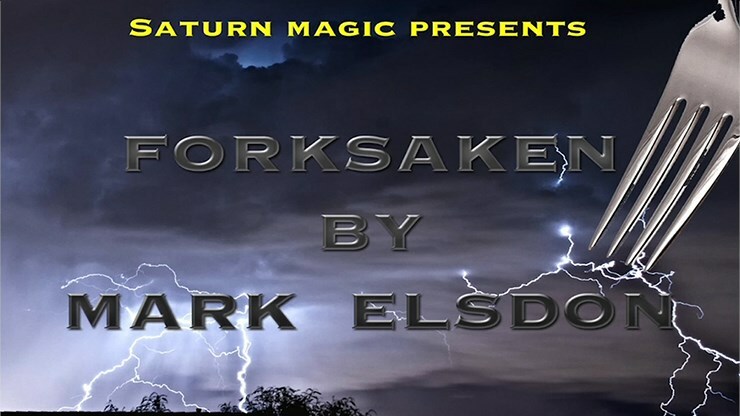 Forksaken is the new impossible card stab from Mark Elson, perfect for close-up and stand-up - one in which not only is an astonishing piece of magic, but one that leaves your spectator with an impossible object as a souvenir! Combining his love of puzzles with his knack for creating powerful and practical magic, Mark has devised an incredible piece of close-up and stand-up card magic. You have your spectator look at a card in the deck, which is then clearly shuffled. You then proceed to show a brown paper bag and a fork. The cards are dropped inside the brown paper bag and given a shake. The fork is then also placed into the bag as you appear to be fishing for something inside the bag. You then slowly remove the form and a face-down card can clearly be seen on its end. The fork has pierced one playing card. All of the other cards are tipped out of the bag and spread out face up while you ask if the spectator can see their card anywhere. As they soon realise they cannot, you turn over the fork and the card is seen to be their selection. But there's more! As a kicker ending, you ask the spectator to examine the impaled card. It is soon apparent that what they are looking at is an impossible object. The way in which the fork is entwined with the card seems impossible, and indeed the spectator will be unable to remove the card without destroying it. You can then allow them to keep the card and fork as a souvenir. There are no tears, folds or misprints - it is a regular card and a regular fork, and the impossible object can be immediately given away. All the necessary props are provided to learn and perform this immediately with your own deck and the video instruction includes the full method of how to make the impossible 'card and fork' object (which is easy once you know the secret), as well as all the details of the full routine, plus bonus handlings including a torn corner version for parlour, close-up and walkaround.